And guess what? It was wonderful! I kept expecting the plans to fall through at the last minute, but it all worked out. We’re so thankful, because the break was sorely needed. We were gone Friday until Monday and spent most of that time just catching up on sleep. I even got some editing done! At one point, we were slightly worried we’d get snowfall and end up somewhat trapped but, in the end, all we had was heavy wind and rain that very first night. 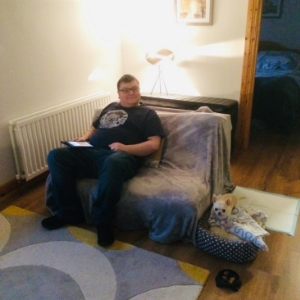 Giles (the dog) was a bit unsettled at first, so I sat with him during the worst of it and finished reading a book (Phantom Phantasia by Claire Savage). The best part, though, had to be the views. After several attempts at trying to capture the sunrise and general landscape, I ended up with these shots which both A- are quite possibly the most gorgeous photos I’ve ever taken (IMHO), and B- a pale imitation of the real thing. 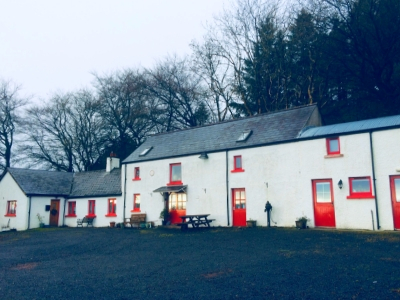 We were staying at Ballyeamon Barn in the Glens of Antrim – part of the Glenariff Forest Park – somewhere between Ballymena and Cushendall. There were red squirrels scurrying about, and we got to sit in (and indeed take part) in the barn’s regular Saturday night ‘session’ of songs and storytelling. Given our situation (as described in the blog post linked above), Steve and I don’t get a chance to get away often, if at all. Our last holiday was a couple of days up the North Coast for our honeymoon, the first day of which Steve spent recovering from a seizure. We were only able to have that due to the kindness of friends who organized the apartment for us all (for they went on the trip, too) and who gave us a lift. Needless to say, this trip (as the first), meant a lot to us. Thanks be to gorgeous, generous friends!